The ballot unit of an electronic voting machine or EVM was found by villagers lying unattended on a national highway near Shahabad town in Rajasthan's Baran district on Friday night, leading to suspicions of yet another electoral irregularity in the recently concluded assembly polls. However, officials later clarified that the unit -- numbered BBAUD41390 -- was a spare one being transported to the district warehouse under the supervision of the local administration. "It was an reserve category ballot unit that was not used in the actual poll yesterday," a polling official said. "It was supposed to be taken to the Shahabad tehsil office along with electronic voting machines, but had tumbled off the vehicle along the way." News agency ANI quoted District Election Officer SP Singh as saying that two poll officials, Abdul Rafeeq and Naval Singh, were suspended for negligence. Then, as per protocol, the machine was sent to the district headquarters for safekeeping in a strongroom. 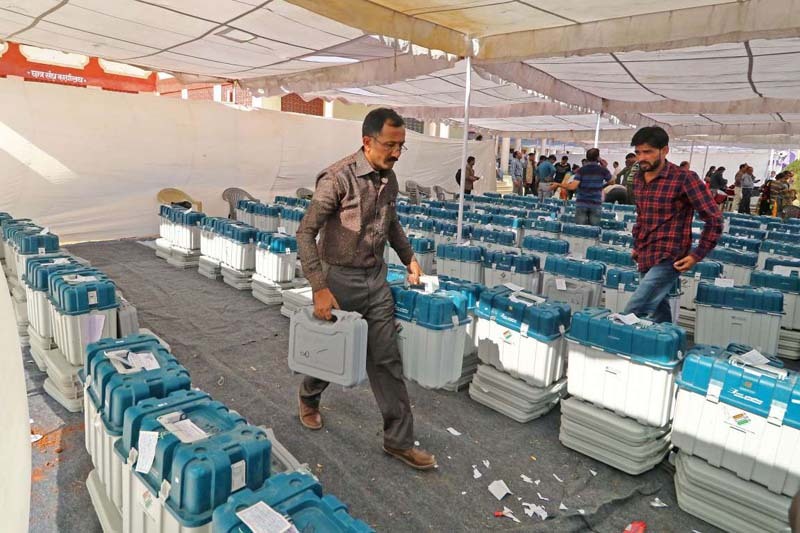 The discovery of the ballot unit on the National Highway-27 raised concerns in the wake of several lapses that cropped up in the recent assembly polls across five states, especially Madhya Pradesh. The first such report cropped up when Congress parliamentarian Vivek Tankha complained to the Election Commission that several reserve EVMs were brought to the Sagar district collector's office in an unregistered school bus over two days after voting on November 28, indicating that they could have been tampered with elsewhere. Most opposition parties in the country want paper ballots brought back in the next Lok Sabha elections owing to the alleged susceptibility of EVMs to technological manipulation. However, the Election Commission maintains that returning to the previous system makes "no sense", and voter-verifiable paper audit trail units should be more than enough to put all such doubts to rest.